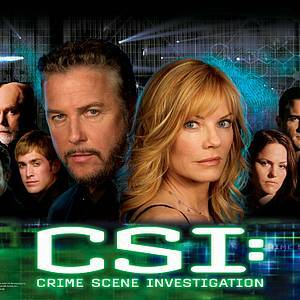 CSI: Crime Scence Investigation is a pinball machine based around the popular television franchise. The pinball is licensed from CBS Consumer Products; and features original speech from characters from the franchise and music from the television show. 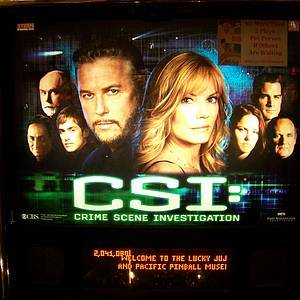 Pinball Hall of Fame artists John Youssi and Margaret Hudson created the artwork, and CSI series creator Anthony E. Zuiker also assisted in the design of the machine. Features of the pinball include a mechanical skull that loads pinballs into its eyes for release before rising above the play-field to start the Skull Multi-ball. 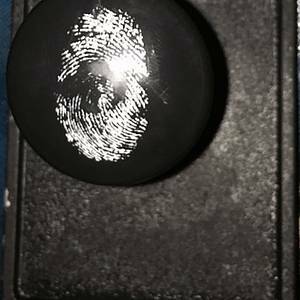 In keeping with the forensic theme, the Microscope Multi-Ball features a microscope mechanism which captures the pinball on a magnet. 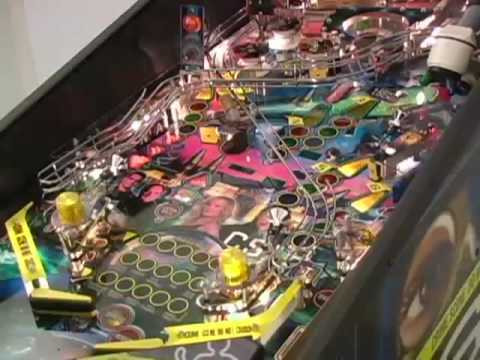 Other main features include a bullet scoop shot that catches the pinball and propels it back into gameplay, and a centrifuge spinning disc that captures the ball and thrusts it into play. Software: Keith P. Johnson Lonnie D. Ropp Lyman F. Sheats Jr.
"Guys...you're not going to believe this." This game has received 109 approved Pinsider ratings and currently has a rating of 7.178 out of 10. 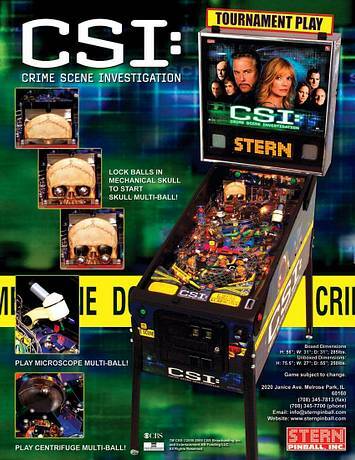 This game ranks #215 in the Pinside Pinball Top 100. There are 56 rating comments for this game. 85 Pinsiders have this game on their wishlist. 68 public locations known where you can play this machine.